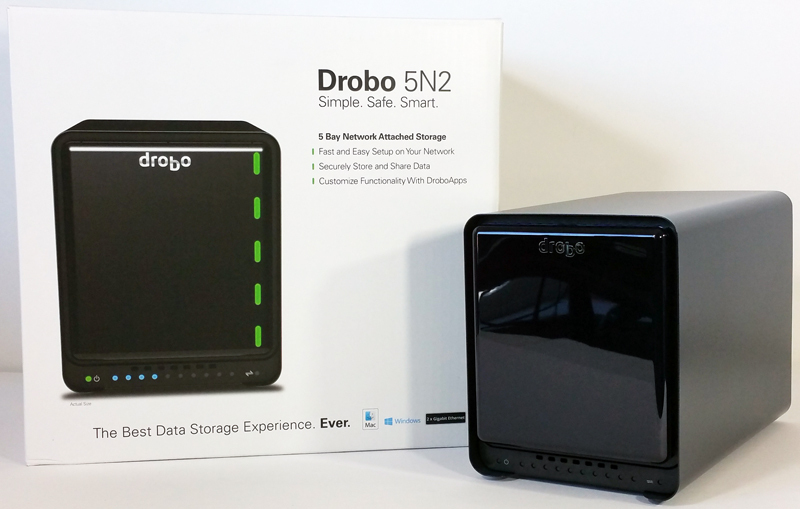 Today Drobo 5N2 5-Bay NAS is finally unveiled and we can publish our review. 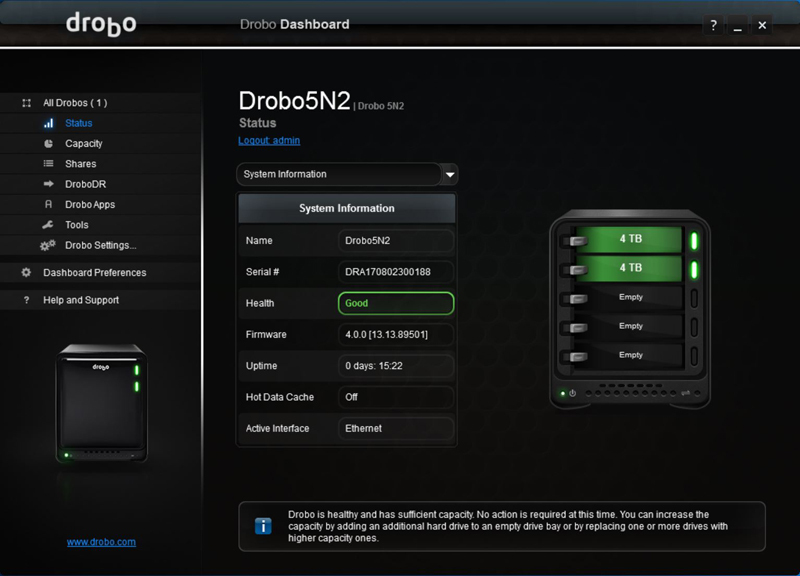 This is an upgraded version of Drobo’s 5N and offers many of the same hallmark features of the platform we saw in our Drobo 5C review. As you will see, the Drobo 5N2 is a network storage solution designed to get you up and running with your data protected with a minimal amount of effort. 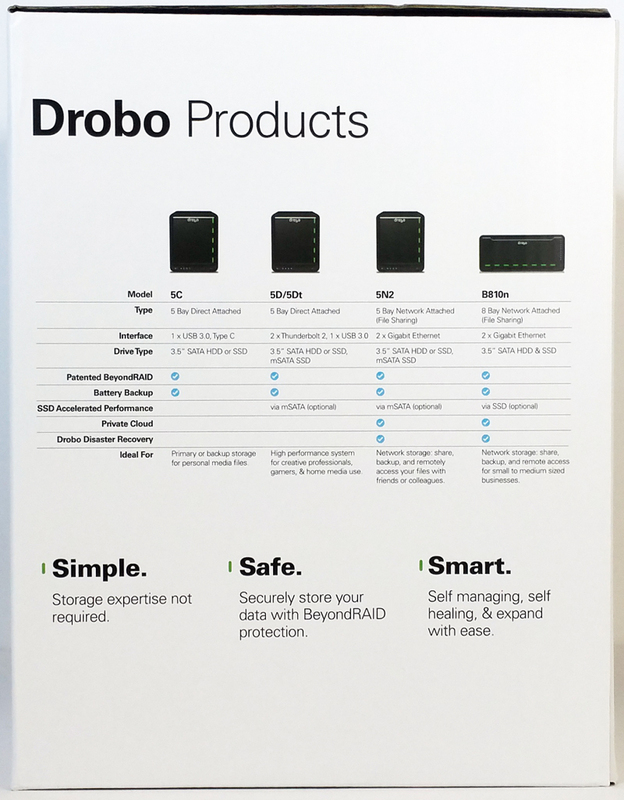 The Drobo 5N2 designed for the connected home and Small to Medium Businesses (SMBs) segments who want a simple, safe, and smart storage solution. 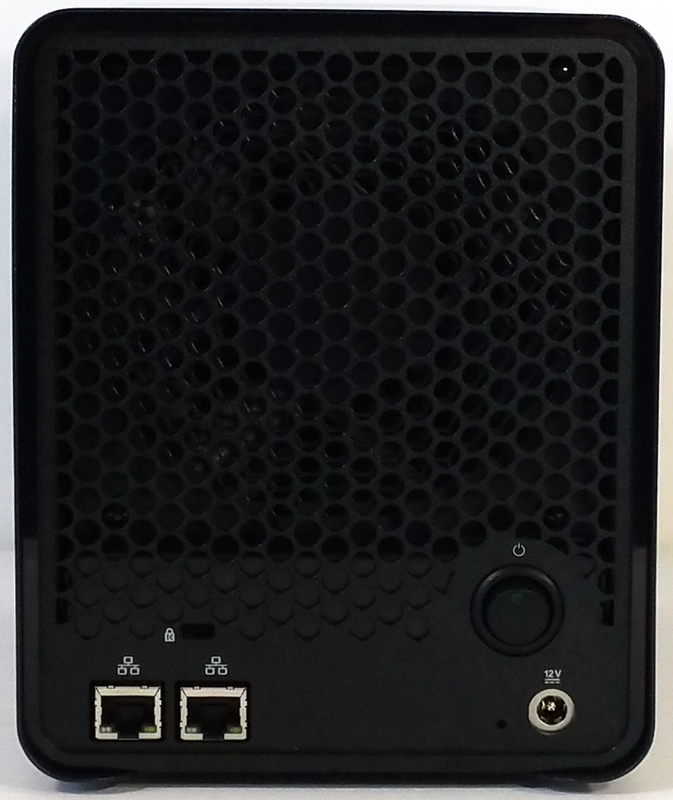 The 5N2 has secure remote access and enterprise level DroboDR functionality. 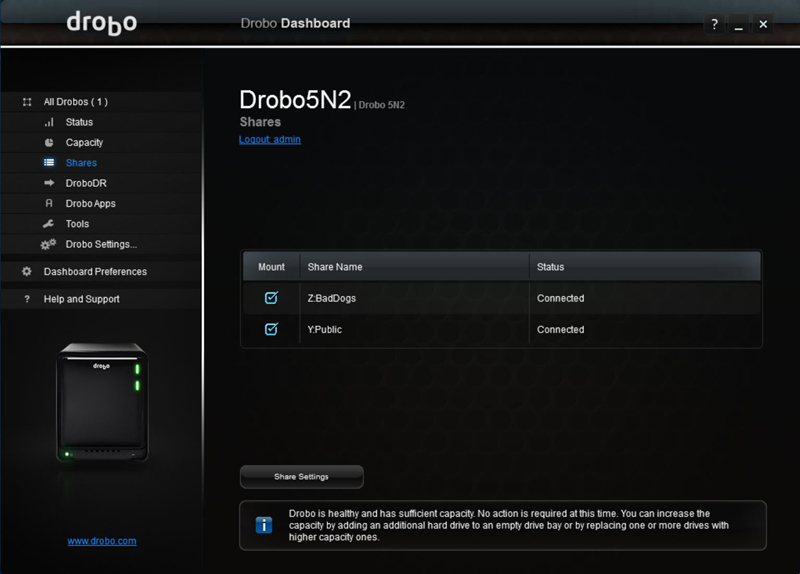 This Drobo also includes access to DroboApps, which extends the functionality of Drobo NAS devices. 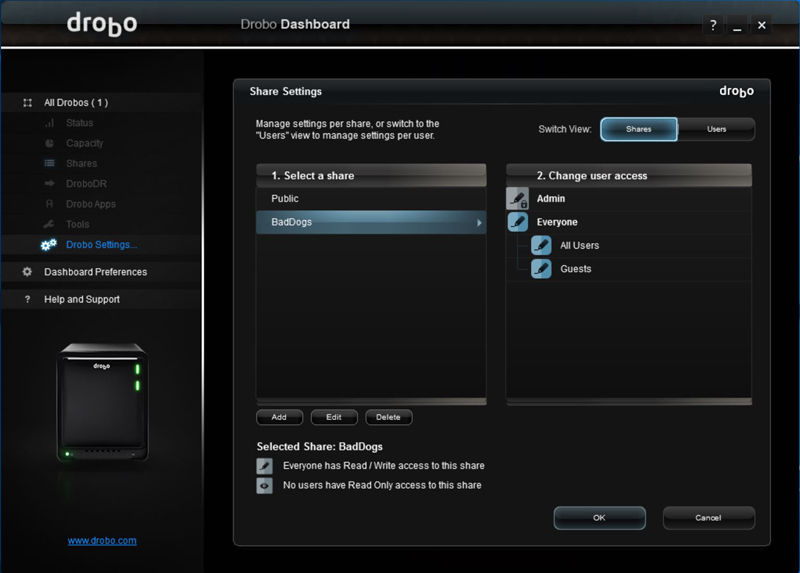 Applications such as DroboAccess (private cloud solution) and DroboPix (mobile pictures and video management) allow users both privacy and security of their data on a Drobo they own. Adaptive Link Bonding with Two Ports is also very simple, just two clicks in the dashboard and both network ports are bonded for higher network performance. For power protection, the 5N2 includes a battery that protects write cache from power loss while data is being written to drives. 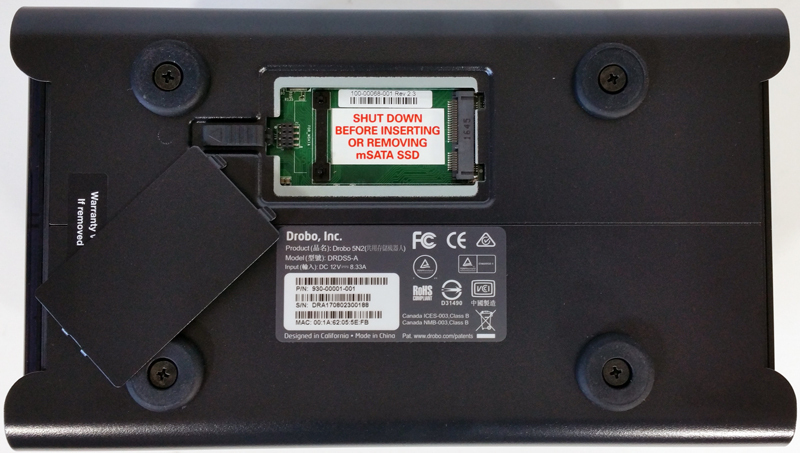 When power spontaneously goes away, the battery keeps the Drobo alive long enough for the data to be written to non-volatile storage. The out of box experience is almost exactly like the Drobo 5C we reviewed previously. In fact, the units look alike. 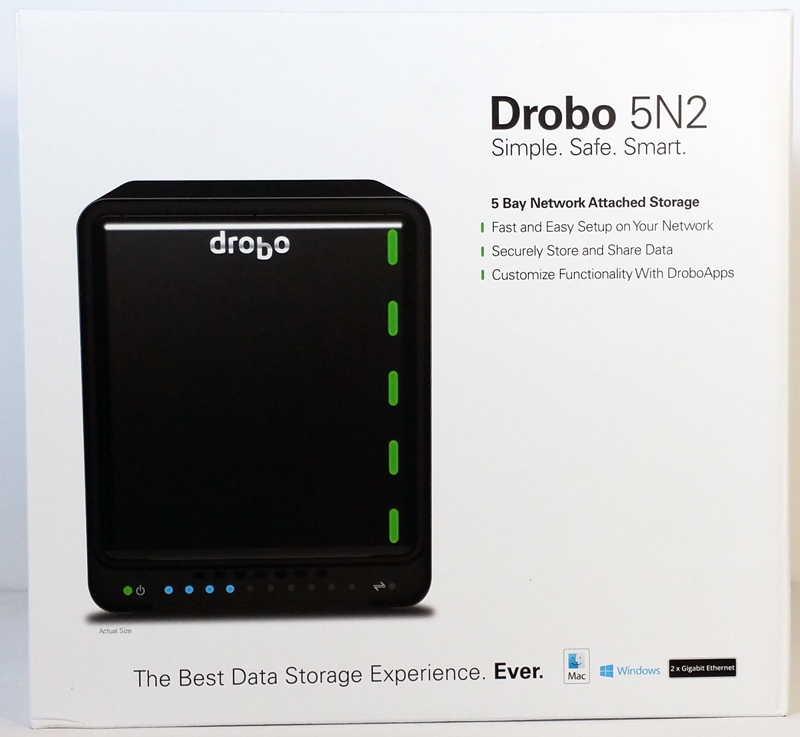 The Drobo 5N2 comes in a large white box that lists its key features. 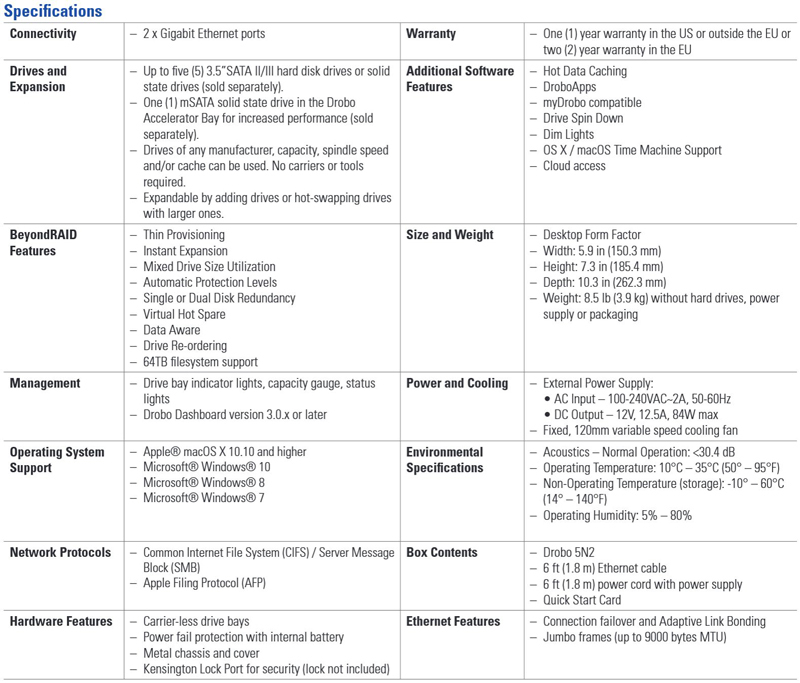 Looking at the back of the box we see the specifications and the back of the 5N2. 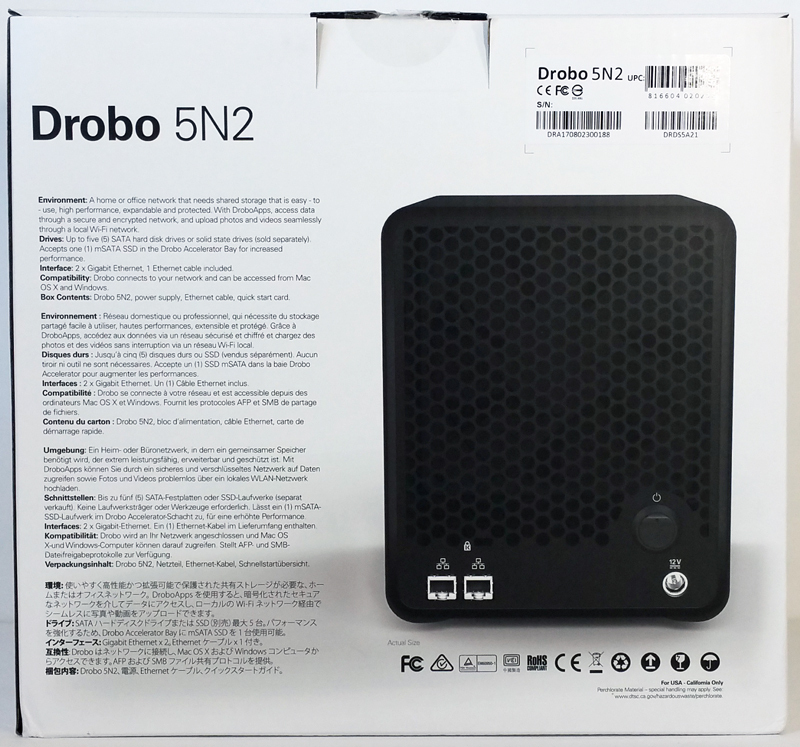 The left side of the retail box highlights the 5N2 capabilities and compares that to three other Drobo products. After opening the retail box and removing the top accessory box we find the 5N2 nestled deep in the box. Protected by plastic thermoformed cushions that provide a good 1.5 to 2 inches of air space around the 5N2. 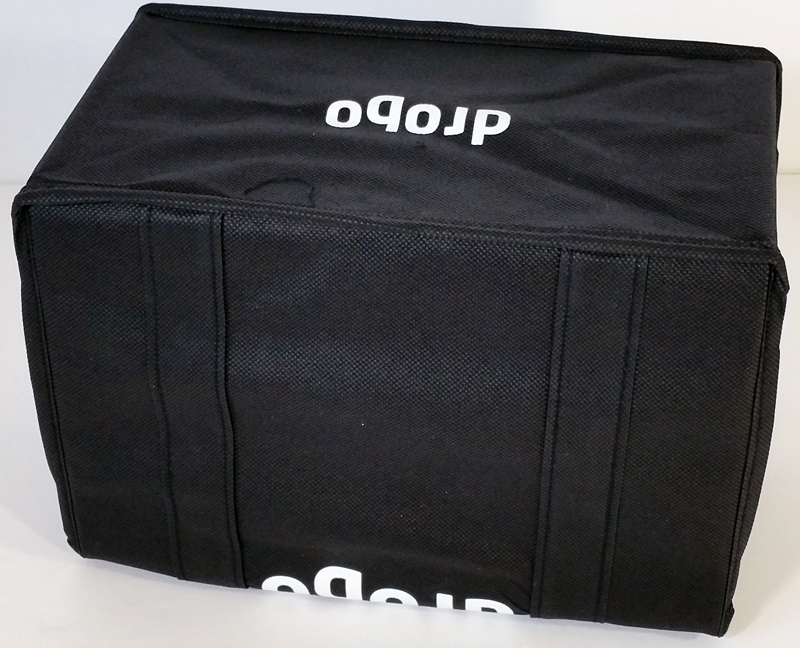 The 5N2 itself comes inside a heavy duty cloth carrying bag that is fairly tight fitting, just like the 5C. 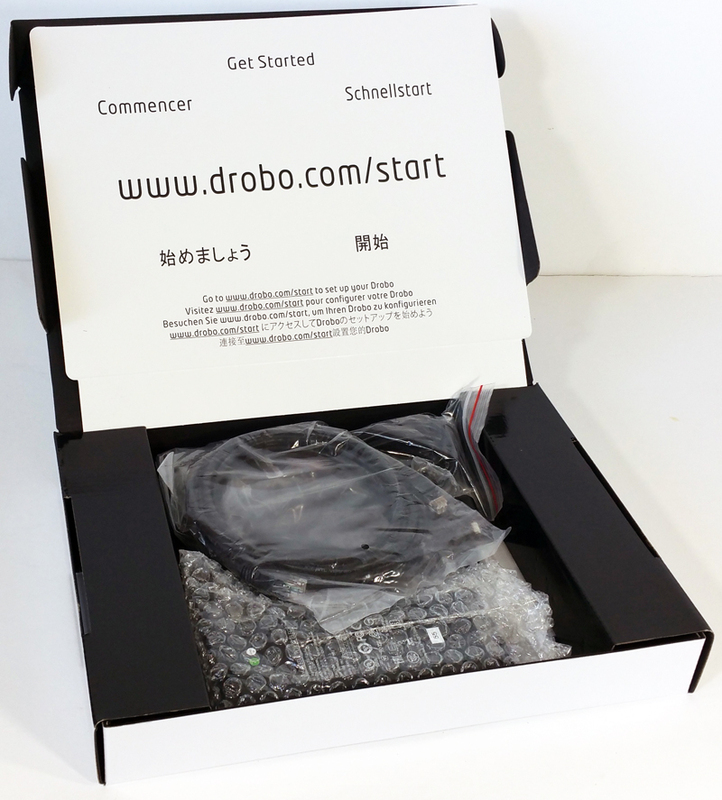 The accessory box that comes at the top of the retail box welcomes you to the world of… Drobo. 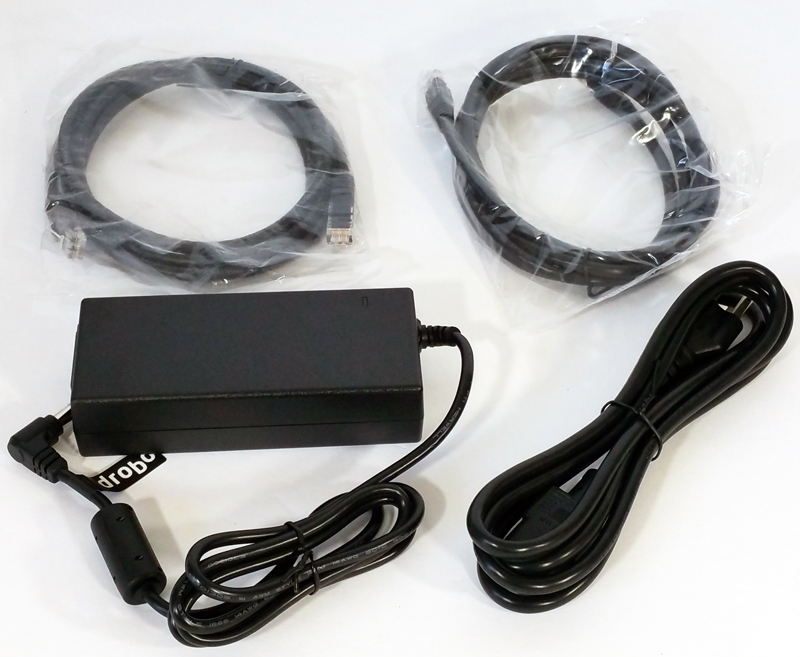 Opening the accessory box you spot the Get Started command line to enter into your web browser and the accessory contents. We also found a card that offered a 90-Day DriveSavers recovery service plan, along with a warranty information card, a Drobo sticker, and several Drive Bay actions stickers in three different languages. At the back of the 5N2, we find a large 120mm variable speed cooling fan, power plug, power switch and two Ethernet ports. No tools are required for inserting hard drives, pull the locking thumb latch to the side and insert the hard drive. It will lock in place when in final position. At the bottom of the 5N2 we find a mSATA port, which enables Hot Data Caching through the Drobo Accelerator Bay. This feature intelligently uses high-performance flash to accelerate performance, allowing the fastest possible access to your data. The 5N2 setup is exactly like what we found on the 5C, that is, extremely easy. You can head over to our Drobo 5C review to check the setup in detail. 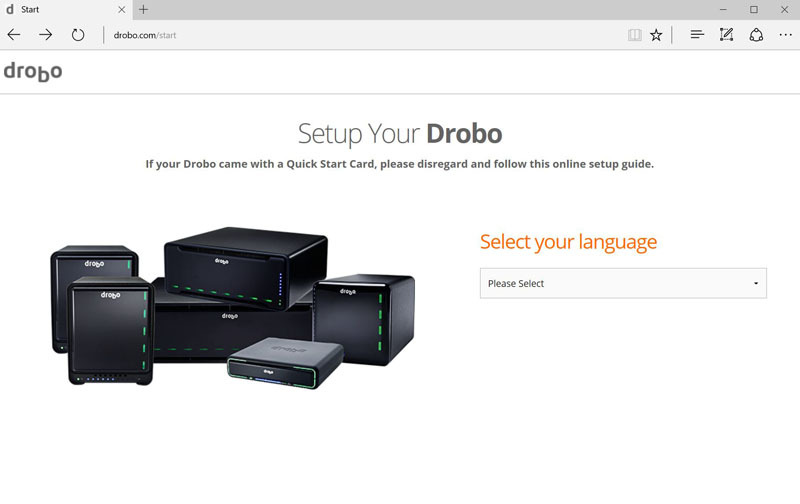 The only major difference is that you will setup the Drobo with a network address. We found the setup very easy to do and in a few minutes we had the DroboDash installed so let’s take a look at this central piece of software for controlling your 5N2. We have two of our Western Digital 4TB Red hard drives inserted into the 5N2, it tells us that we need to format these so we hit Yes and let the 5N2 take care of that. The 5N2 will format and wipe all data from our drives. After the format process is complete which only took a few minutes we can now see how the 5N2 is operating. 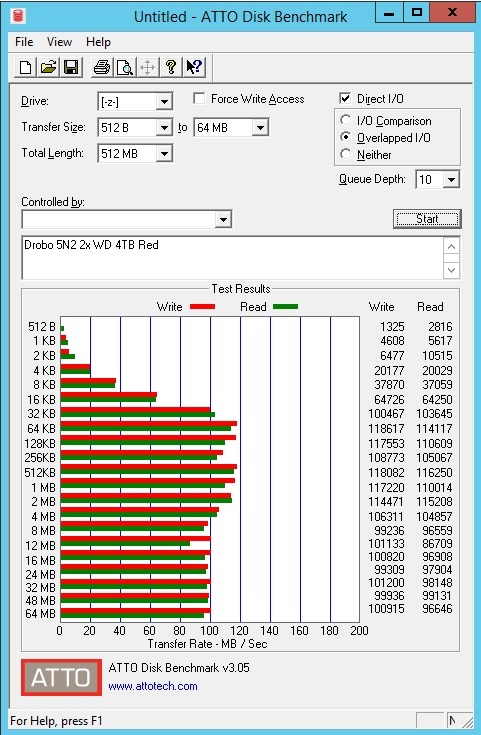 This shows our two 4TB drives in good working condition. Moving down the left side menu we can select capacity to see what our running capacity is for the 5N2. Our storage configuration breaks down as follows for empty drives. Moving down to Shares we find this window. This is where we can set up Shares on the 5N2. To manage Shares click on the Share Settings Button where you can create or delete Shares. After clicking the Share Settings Button we see that you can manage users and user access to each of the Share Volumes. 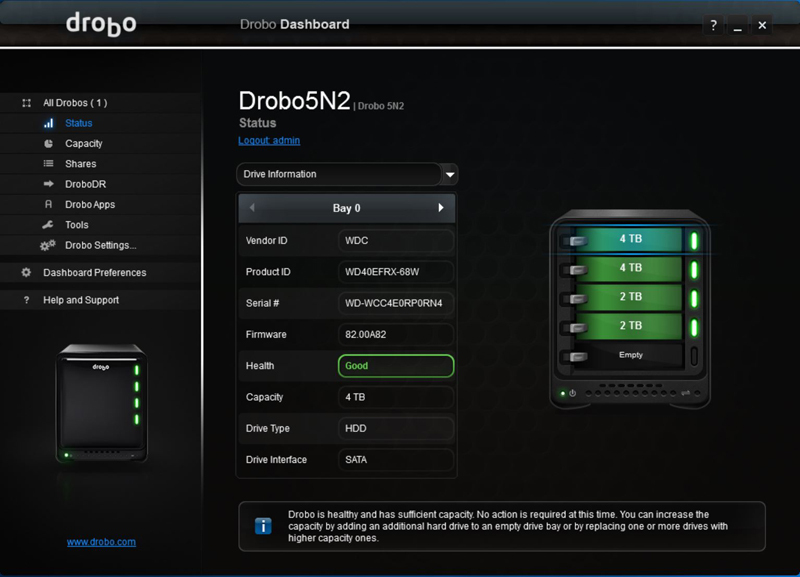 To ensure data is safe, the 5N2 also comes with the DroboDR (Disaster Recovery) software solution developed by Drobo. With DroboDR, users can set up a pair of 5N2s to make an offsite copy of data. Under Apps, we find the list of applications that you can use on your 5N2. 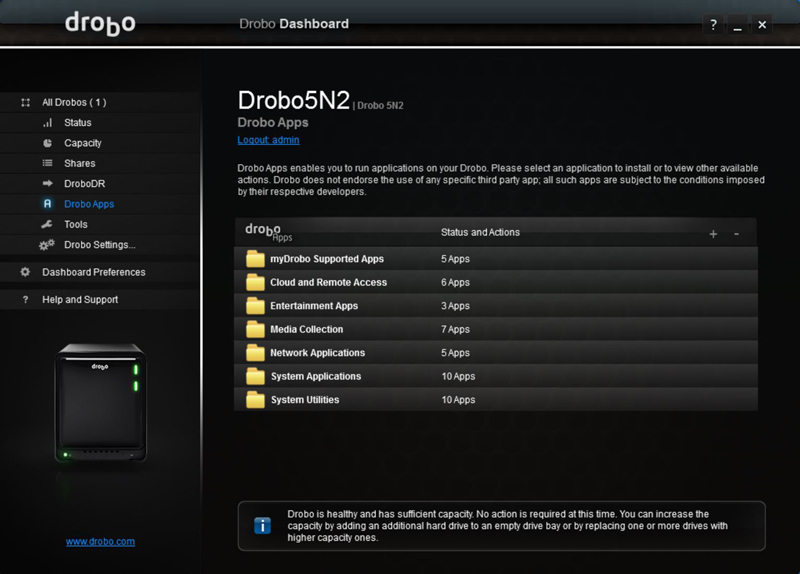 All Apps available for automatic installation via Drobo Dashboard. From the Tools menu, you can safely restart or shut down your 5N2, check for updates and turn LEDs on or off. 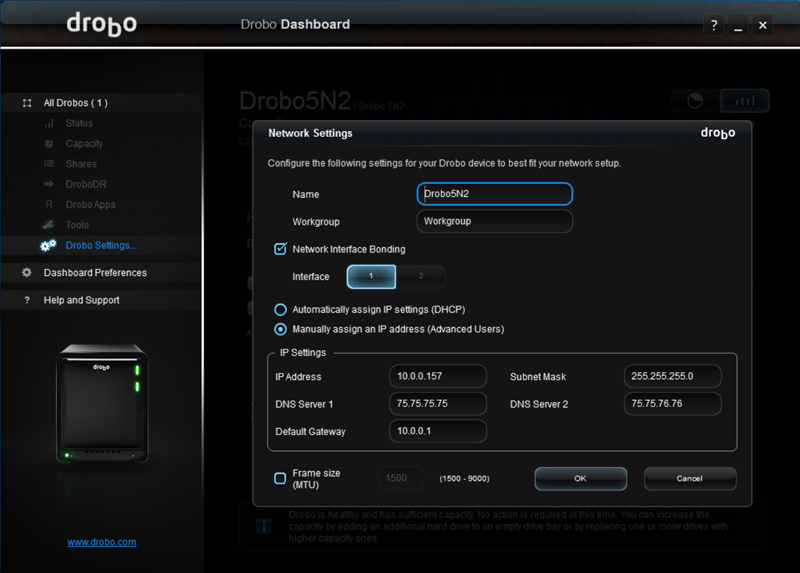 Moving to Drobo Settings we come to Network Settings. You can change the name of your 5N2. 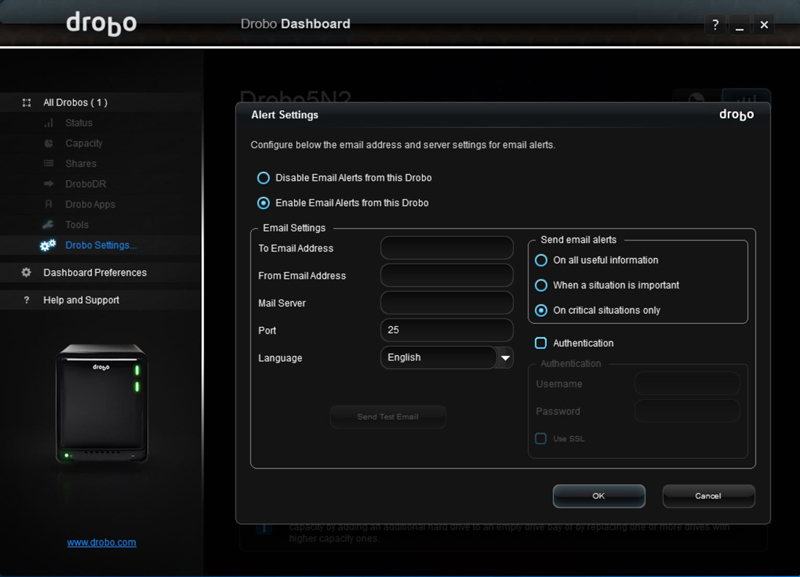 Under Drobo Settings you can set various alert messages and how you would like to receive them. We begin our tests with our two WD 4TB Red NAS drives that we use in all our tests. 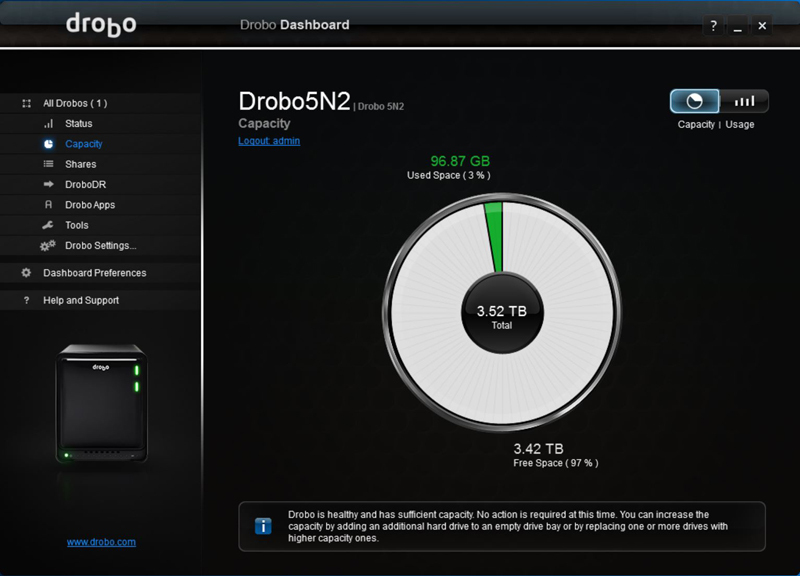 Then we wanted to see how the Drobo 5N2 worked when adding in different drives. The drives we will use in the Drobo 5N2 are Western Digital 4TB Red NAS HDD and Seagate Ironwolf 2TB NAS drives. We start off our tests using two WD 4TB Red NAS Drives. The performance was very respectable reaching 116 MB/s Reads and 118 MB/s Writes. We have two WD 4TB Red hard drives installed here, we compared these results with previous two drive NAS units we have looked at before. 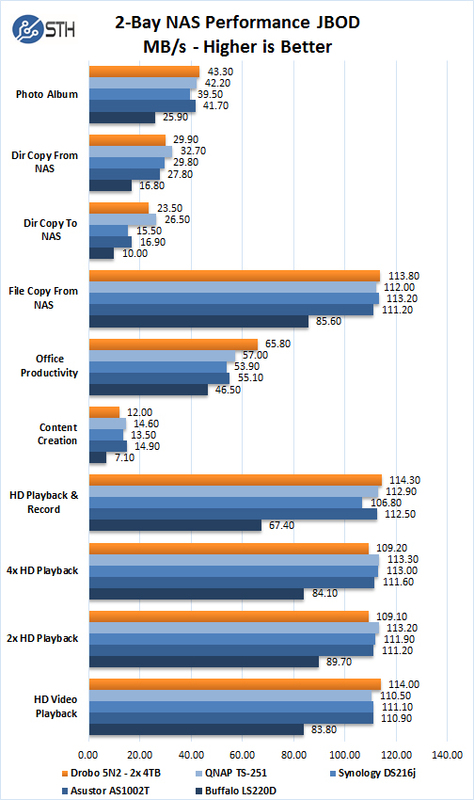 In this configuration, we see benchmark results are very similar to these NAS units. One extremely common upgrade in this category of NAS is upgrading to additional drives. Adding additional drives to the 5N2 is very simple, just insert the drive into the 5N2 and it will take care of everything you need. It was only a few seconds before we found the new drive ready for use. 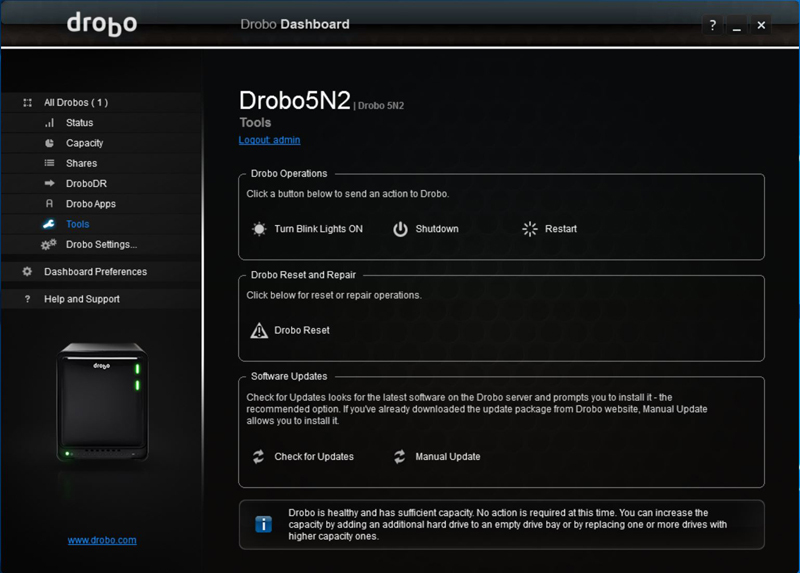 Drobo handles all of the configuration behind the scenes. In this case, we added one drive at a time, allowed the system to add that drive to the drive pool before we added the fourth drive. Here we have all four drives installed in the 5N2 and show good working condition. 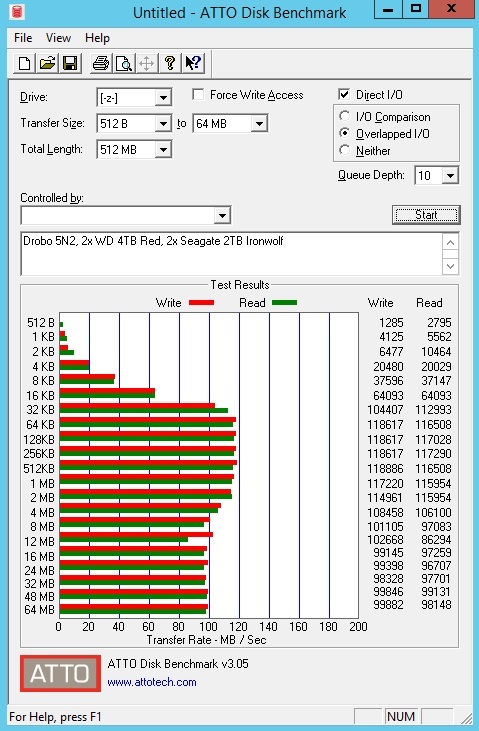 This shows the result of adding our two Seagate Ironwolf 2TB NAS drives, this gives us a total of four drives installed into our 5N2. The Capacity menu shows the new capacity of the 5N2. 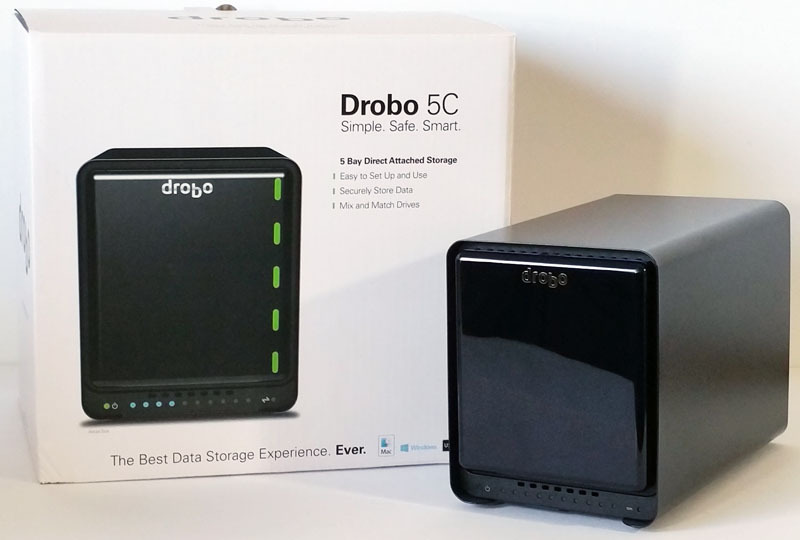 The key difference here is that while many NAS units go into excruciating detail in terms of RAID levels, Drobo simply breaks down how the disks are being used. Our storage configuration breaks down as follows with our four empty drives. All of this was configured automatically, without delving into different RAID levels, block sizes and other nuances of more complex storage. 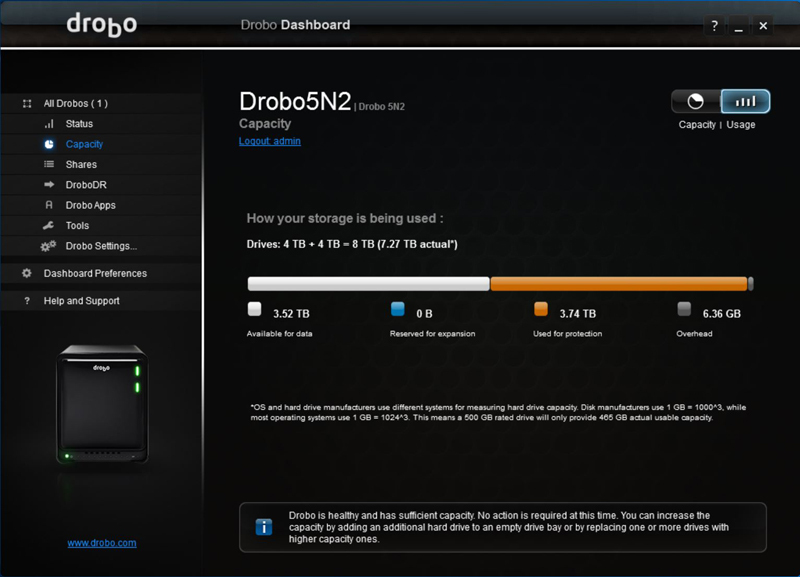 Drobo is, simple. Let us run our tests now with the added drives. After running this test, we do see a slight drop in performance with 117 MB/s Reads and 118 MB/s Writes. Still performance is essentially on par with what gigabit Ethernet can offer. We now will compare results to a four drive NAS we have reviewed earlier. 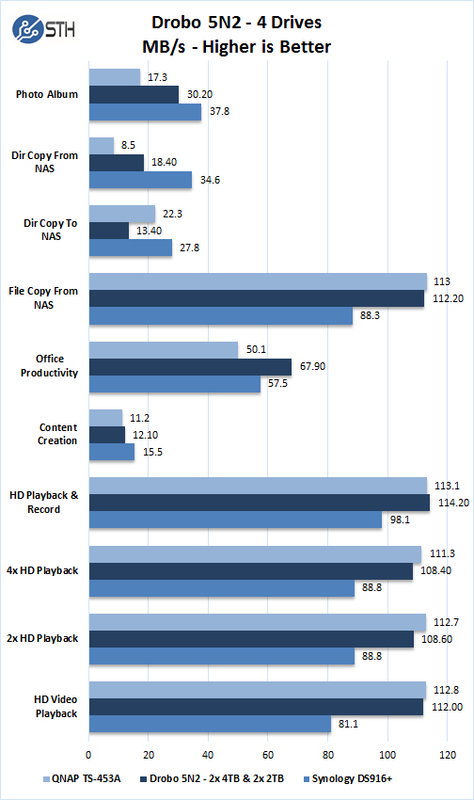 Here we can see the Drobo 5N2 is about equal in half of our tests, while some results appear lower. 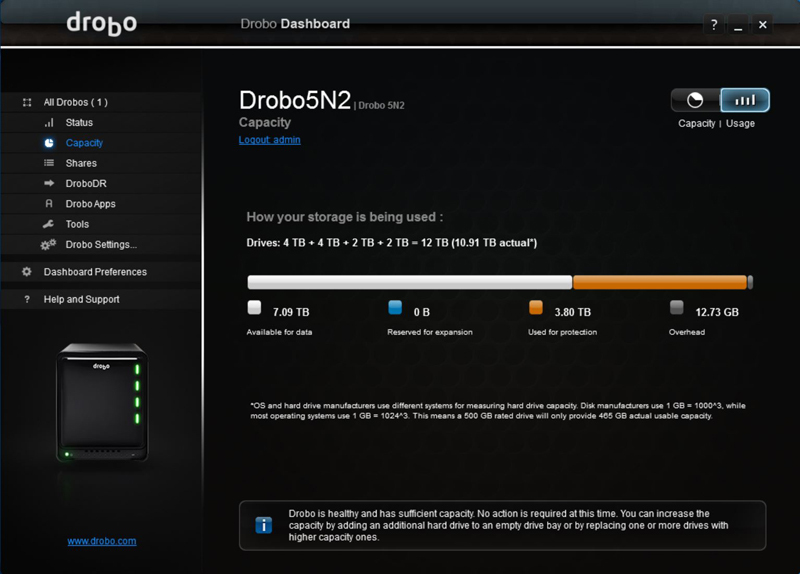 Drobo offers a capacity calculator which can inform you on what capacity you might expect when adding drives to your 5N2. Here are how our four drives would look installed in our 5N2 which matches which is close to what we saw in the web interface. In our review of the Drobo 5C we found it to be an impressive storage device, now we have looked at the network attached storage (NAS) version, which is an upgraded version of Drobo’s 5N. What we found under the hood of the 5N2 is the very same exceptional features we found with the 5C. The ability to simply add drives of any capacity to your existing array or even pull out smaller capacity drives and replace them with large capacity drives at any time makes upgrading your NAS storage capacity a snap. This is the main reason why we tested the 5C and 5N2 with two different capacity drive combination’s, we wanted to see how performance would stack up doing this. With other NAS boxes you are forced to use the same drive throughout the array, you can start with fewer drives in some boxes, it is a simple matter of adding another drive to the array when you decided to but it must be the same capacity drive. You will get shoehorned into a given capacity for your NAS depending on what drives you decided to initially set it up as. 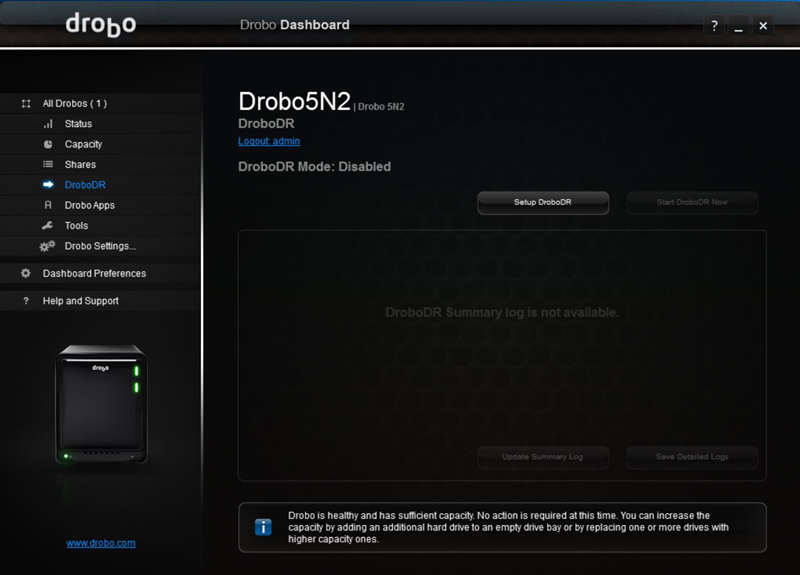 With Drobo devices, you have much more flexibility when setting your boxes up. Deciding later to use large capacity drives, no problem, just swap out your drives and replace them. DroboDR (Disaster Recovery) software solution also makes backing up your current 5N2 as simple as setting a software switch. The second 5N2 can be off site to protect you from disasters. If such an event should happen to bring the backup 5N2 back into your office and set the software switch to main unit and you are right back to work conditions. Hi. I’ve had a 5N for a few years so I was interested in your review. Do you have any comparisons of the 5N2 with the 5N? I see it has a 2nd ethernet port and it says the processor is faster but that doesn’t tell me exactly what differences I’d see if I upgrade. You did a review on the lenovo ThinkStation P410 at the end of last year and mentioned “there is a limited time 30% off instant savings option on our page that drops the price to $1,654.80.” Can you tell me what you are referring to by “our page?” How do I get the 30% off? Thanks again.